The human foot is a beautiful, strong and complex anatomical structure comprising of 26 bones, 33 joints and hundreds of tender muscles, tendons and ligaments. Over a quarter of a million sweat glands can also be found in the foot in addition to various strong fibers that are utilized to keep all of the moving parts together. Naturally, with anatomy as complex as that seen in the human foot, there exists a profusion of complications that can occur for a variety of reasons and result in necessary foot treatment in Los Angeles. Often times, most foot related ailments occur as a result of overuse, sports injuries, poor fitting shoes or the foot being placed under a significant deal of stress. On average, Americans spend over 4 hours on their feet a day and walk an average of 10,000 steps a day. It’s no doubt the foot can become unduly punished over time. Likewise, the foot and its myriad of parts are decidedly more prone to experiencing issues caused by various other unrelated problems. If any part of the foot, be it the toes, heel, ball, etc, aren’t healthy and don’t work in unison, it is commonplace for the ailments to affect the overall quality of life for the patient and even occasionally result in the inability to walk or stand. With approximately 85% of Americans at one point or another enduring foot pain, most patients afflicted with a foot ailment are experiencing one of the top five most common foot related indispositions which affect millions of Americans. Read on to discover the five most common foot problems and their correlating correction procedures. For most, their beautiful and healthy feet can often be overlooked or taken for granted. Unfortunately, it oftentimes isn’t until we experience an unsightly and painful foot deformity that we realize the pure splendor of our healthy and vibrant feet. Bunions, for a great portion of Americans, is that exact deformity that affects millions of people, as it is one of the most common foot ailments in the country. A bunion, simply stated, is a painful bony bump that is found in the connecting joint between your big toe and foot. Bunions are very common, so common in fact that they affect nearly 1 in every 3 women in the country. According to the American Orthopaedic Foot and Ankle Society, 9 out of 10 bunions occur to women and are often caused by wearing tight, narrow high heels and shoes. Ultimately, a bunion causes the base of the big toe to get larger, stick out and creates significant pain for the victim. In many cases the overlaying skin on the foot may become red and swollen which makes wearing shoes, walking and even standing, extremely painful. Bunion treatment can consist of bunion surgery where your doctor and podiatrist will begin by performing an examination of the foot and bunion. In some cases, an X-ray may also be utilized in order to discover the overall extent and severity of the foot ailment. If it is gauged that the overall foot pain is in fact caused by a bunion, there are various treatment options available. It is true that there are a variety of surgical, and in rare cases non-surgical, methods for correcting bunions, the most common of which is a bunionectomy. 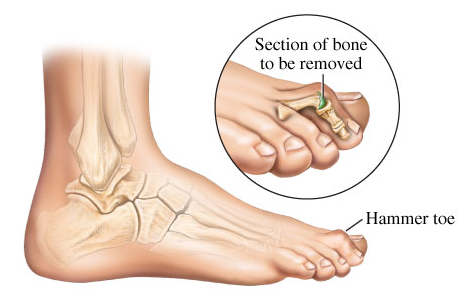 A bunionectomy is designed to remove the inflamed tissue around the toe joint, straighten the toe via partial bone removal, realign the bones of the toe to the natural angle, and permanently correct the bones of the affected toe joint. All-in-all, a bunionectomy corrects bunions and restores healthy and beautiful feet. Read on to learn more common foot problems. In addition to occasionally being very unsightly, corns and calluses can also be very painful. Often caused by poor fitting shoes, corns and calluses are created due to excess friction or pressure being placed upon the skin of the feet. A foot callus, also known as a tyloma, is an area of skin the thickens after excess friction exposure. A corn however, is a less girthy type of callus that develops on top of and even between toes. It often varies from patient to patient whether or not pain is in fact associated with calluses and corns. Regardless, treatment is always a great idea in order to prevent further issues. Treatment is especially necessary for diabetics, as corns and calluses are almost always signs of larger complications. Corns and calluses can oftentimes be contributed to external factors such as ill-fitting shoes, excess manual labor, frictional stress inducing activities and failing to wear shoes. Many of these events result in the development of corns and calluses on the feet and between the toes. However, external events are not the only causes of corns and calluses. They can also be produced in patients via internal events as well. For example, abnormal foot mechanics, faulty foot function, bony prominences and structural deformities, such as bunions, all can lead to the precipitation of corns and calluses. On occasion, corns and calluses of the feet can be corrected by wearing properly fitted shoes and by protecting the affected areas while you allow the corns and calluses to heal properly. However, for diabetics it is necessary to seek treatment from a podiatrist. Continue reading to find even more common foot problems. Plantar Fasciitis is known as the most common cause of heel pain. The ailment is a disorder that causes pain in both the bottom of the feet and in the heel. The ligament, or fat band of tissue, that connects from your toes to your heel bone is known as the plantar fascia and is utilized to support the arch of your foot. If an incident occurs that leaves the plantar fascia strained, it becomes weak, inflamed and swollen, which results in heel pain and pain on the bottom of your foot. While the causes of Plantar Fasciitis are unknown, the pain created as a result of the ailment presents itself quickly and the pain is often most severe when walking. The severity of the pain is even greater when walking after great periods of rest. For example the pain of plantar fasciitis is likely to be the greatest when walking or standing after waking up in the morning. Despite the fact that the causes of plantar fasciitis are unknown, the signs and symptoms are very notorious. When the ailment occurs, the pain in the heel and bottom of the foot is very sharp and often unilateral, as seen in the overwhelming majority of cases. Additionally, it is important to identify if pain is worse after long periods of rest. One of the largest identifiers of plantar fasciitis is increased pain in the heel or bottom of the foot subsequent to long periods of rest. Finally, various other symptoms are presented by the ailment, however they are much less prevalent. For example, a few symptoms of the ailment include tingling, numbness, swelling and radiating pain in the foot. In the initial stages of plantar fasciitis treatment, Dr. Jamshidinia diagnoses the ailment and reviews your medical history. Following diagnosis, the physical exam begins where he checks for points of tenderness in the foot which allows the Doctor to determine if the ailment is being caused by other medical issues. There are both surgical and non-surgical treatment methods that can be utilized to treat plantar fasciitis. The determination of which treatment is better is dependent on various factors, including the patient’s medical history, severity of the ailment and more. An ingrown toenail, or onychocryptosis, is a painful condition of the toe where the nail grows into the skin rather than over it and is one of the most common foot problems. While the condition most prominently affects the big toe, it can also occur to any toe and can become infected very easily. Infections leave victims with painful, swollen and red nails that are extremely painful and sensitive to touch. Ingrown toenails can be caused for a plethora of reasons, the most common of which is cutting the nail improperly. Improper cutting of the nails is easiest to occur for the big toe. When the nail is cut too short it can grow improperly and into the skin rather than over the skin. There are various methods and home remedies for treating ingrown toenails. However, it is commonplace for home remedies to be ineffective. The most effective ingrown toenail treatment is offered by podiatrists. Dr. Jamshidinia can treat ingrown nails through three methods. For a slightly ingrown nail, lifting the nail can prove to be an effective treatment. Otherwise the ailment can be treated by partial or total removal of the ingrown nail and tissue. The most common foot affliction that affects Americans is toenail fungus. Nail fungus is a very common condition that, despite popular belief, is not caused due to poor hygiene. Instead, nail fungus is often caused by feet being exposed to dark wet places for extended periods of time. Naturally, there exist various causes of fungus. Regardless, the effects of the ailment remain the same. Toenail fungus begins as a white or yellow spot under the nails. Eventually the fungus penetrates deeper into the nails and causes the nail to thicken and discolor, resulting in unhealthy and unsightly nails. Generally men are more prone to getting toenail fungus. In fact, men are significantly more likely to get the toe ailment than women. Additionally, age is an important contributing factor to the diagnosis of toenail fungus. It is commonplace for elderly men to suffer toenail fungus more frequently and in greater proportions than younger men or women in general. Other risk factors include smoking, being diabetic, having athlete’s foot or having a weak immune system. The most effective and most dramatic treatment method of toenail fungus is via laser treatment. The remedy is often painless, creates greater results and creates longer lasting results. For most diabetics the ultimate fear is that the disease will result in heart disease, however the possibility of foot amputation is a possibility in severe cases of diabetic foot. It is important for diabetics to get diabetic foot care in Los Angeles. Diabetes is the inability to properly regulate insulin in the body. Because the body is unable to regulate insulin it is unable to convert foods into energy. The inability to convert starches, sugars and other foods to energy over a prolonged period of time can create a plethora of issues to sufferers of diabetes, including many foot related issues. Today’s podiatrists play a strong key role in helping patients with diabetes to manage their symptoms as well as prevent and treat diabetic related foot problems. In the United States alone over 65,000 non-traumatic lower extremity amputations occurred due to diabetes. In fact, diabetes related amputations make up for over 60% of all non-traumatic lower extremity amputations. The keys to treating diabetic foot and preventing amputations is early recognition, regular foot screenings and having a well-trained podiatrist who understands diabetic foot care in Los Angeles. How Do I Know if I Have A Diabetic Foot? Diabetes results in poor blood circulation and causes a decreased flow of blood to the feet. This presents itself in the form of tingling, numbness, throbbing pain or muscle cramps in the foot. Regardless of whether you have been diagnosed with diabetes or not it is important to visit a podiatrist in Los Angeles when these symptoms arise. For patients with diabetic foot, the ability for the body to properly heal the foot when complications occur is significantly lowered. In addition to decreasing the blood flow to the feet, diabetic foot also causes the ability for issues such as bleeding, pain, corns and calluses to heal quickly. If you notice pain in the foot or see corns and calluses on the foot that have persisted and not healed, it is important to visit a podiatrist in Los Angeles. If you are unsure if you are suffering from diabetic feet, one of the most common and noticeable symptoms to identify is the loss of sensation in the feet. Partially due to the poor blood circulation caused by diabetes, sufferers of diabetic foot will lose much of their sensation in the feet and potentially experience an odd numbing and tingling sensation in their feet. Numbness and reduced ability to feel pain. Sharp pains and a burning tingling sensation in the foot. Charcot neuropathic osteoarthropathy, commonly referred to as the Charcot foot, is a diabetes caused condition that affects the bones, joints and soft tissues of the feet. The charcot foot condition is often caused due to a case of diabetic peripheral neuropathy and can create a plethora of dangerous and potentially life threatening foot related issues. Charcot foot causes severe weakening and fracturing of the bones in the feet. Ultimately the condition can lead to deformity, disability and even amputation. Treatment for charcot neuropathic osteoarthropathy is complicated but necessary for the prevention of amputation. In severe cases surgery may be necessary, a specialist and podiatrist likely will also special shoes or custom orthotics following treatment. Regardless of the degree to which charcot foot has reached it is important to treat the ailment quickly and efficiently as to prevent further deformity, ulceration and eventual amputation. In order to prevent or charcot foot it is essential to have diabetic foot care in Los Angeles. Diabetic foot can lead to and cause a vast amount of outer foot related ailments. In fact, diabetic foot can result in the shearing of the skin on the feet which causes blisters or ulceration. Additionally, diabetic foot can lead to corns, calluses, toenail deformity, bleeding and even infection of the feet. How do I protect myself against having a diabetic foot? Proper fitting shoes, and in some cases proper custom orthotics, are a necessary investment to make when you suffer from diabetes. Ill properly fitting shoes can result in a blister, scrape or cut that is very likely to become infected if you have diabetes. Infections lead to a plethora of foot issues and can unfortunately result in amputation in severe cases. When buying new shoes seek out custom made shoes or better form fitting shoes. In some cases, even changing socks can provide enough cushion in the shoes and prevent blisters or cuts. Additionally, you should gradually break in your shoes. In addition to regular diabetes foot exams with a podiatrist in Los Angeles it is essential that diabetes sufferers check their own feet often. Checking your feet once a day, and keeping an eye out for symptoms like numbness or pain in the feet, is necessary in monitoring for progressing foot ailments and the potential of diabetic foot. When analyzing your feet watch for blisters, cuts and other foot bruises or cuts that may not hurt until they become irritated or infected. Even when indoors, it is important to wear slippers, socks or shoes at all times. By covering and protecting your feet you can properly protect calluses and bruises and prevent infection. Various other foot ailments can lead to diabetic foot for those with diabetes. It is essential to correct other foot issues to prevent diabetic foot. If you have other foot ailments visit a podiatrist in Los Angeles to properly heal the issues. Additionally, with diabetes it is important to wear properly fitting shoes, with ailments like corns, calluses and hammertoes it is impossible to do so. Corns are large spots of thick built up skin and will not allow you to fit in your shoes properly. In the same manner hammertoes are a buckled under toe, often seen in diabetics, that makes wearing proper fitting shoes impossible. One of the most important, and perhaps most effective, means for protecting against diabetic foot is to properly manage and control your blood sugar. In fact, a 2006 study by the National Institute of Diabetes and Digestive and Kidney Diseases showed that strict blood glucose control with intensive insulin therapy lowered the chances in people with type I (insulin requiring) diabetes of having symptoms of peripheral neuropathy which includes tingling, burning, and pain, by 64%. The study also found that these results held for type II diabetics as well. By properly managing your blood sugar and regularly visiting a podiatrist in Los Angeles you can greatly reduce the risk of diabetic foot. In addition to regularly washing your feet, it is important to properly wash and dry your feet. Wash your feet in warm, not hot water, and do not soak the feet for long. Soaking your feet can cause sores to heal slower and create more progressively worse issues. Waterlogged feet heal slow, for this reason it is also important to properly dry your feet and wear form fitting socks or slippers after washing your feet as well. Podiatrists are a key part of providing appropriate care for diabetics in order to prevent diabetic foot or progressive worsening of the many foot ailments that accompany diabetes. Most podiatrists recommend annual examinations at a minimum for diabetics. However, for diabetics with peripheral neuropathy that can no longer feel pain in their feet, it is essential to monitor your feet every day on your own and see a podiatrist more often. For diabetics with some risk factors such as pain or swelling it is recommended to see a podiatrist twice in a year. For those who have existing foot conditions, such as ulcers, calluses and corns, it is recommended that you see a podiatrist in Los Angeles frequently. If you have diabetes you should visit Dr. Jamshidinia who will provide more accurate details of how often it is necessary to have a diabetes foot exam. The comprehensive foot examinations monitor foot abnormalities and evaluate foot pulses, sensation and foot biomechanics. Diabetes can be very dangerous and cause various foot related issues that if not monitored properly can lead to infection or amputation of the foot. With over 25 million people affected by diabetes and over 80 million people in America considered “pre-diabetes”, diabetes touches everyone. It is important that diabetics closely monitor their feet and regularly visit a podiatrist in Los Angeles. If you are seeking diabetic foot care in Los Angeles give us a call at 310.247.9255. If you have foot and heel pain in Los Angeles, you could be missing out on the best parts of life. Walking, standing, playing with your kids, these things can become extremely difficult. You likely have tried everything to fix your pain, but perhaps the solution is right in front of you. Custom orthotics can provide the relief that you need and perhaps even help other pains in your body as well. Getting custom orthotic inserts in Los Angeles can completely change your life for the better. Read on to discover five ways that custom orthotic inserts can relieve your pain and give you your life back. Click here to learn more about getting custom orthotics in Los Angeles. By getting custom orthotic inserts in Los Angeles sufferers of bunions and foot calluses will experience relief of the resulting pain. These issues are often caused by friction and undue pressure upon the feet. Proper support can relieve these issues and prevent them to an extent. A podiatrist in Los Angeles can give you custom orthotics to provide relief of bunions and calluses. Custom orthotics, provided by a podiatrist in Los Angeles, can offer relief of various issues caused by pressure on the feet. If you need custom orthotic inserts, or need a podiatrist in Los Angeles give us a call at 310.247.9255. Wearing the correctly supported shoes and orthotics are very important for diabetics. Custom orthotics will relieve areas of excess pressure, accommodate foot deformities and limit the motion of joints. By offering shock absorption custom orthotics will improve diabetics foot pain and offer a level of comfort and pressure relief. A flat foot places a great deal of stress, and pressure upon the foot leading to potentially severe pain. Additionally, patients with flat feet often have their body knocked out of alignment which puts a significant amount of stress and pain upon their body. By getting custom orthotics from a trained podiatrist in Los Angeles patients with flat feet can achieve relief from their symptoms of flat feet. For people who have high arches in their feet, they can find that there is an extra level of stress put upon their joints. Additionally, due to high arches there is a lot of stress placed upon the body. High arches lack support and a solid foundation for the body. Getting custom orthotic inserts in Los Angeles can give you specialized support for your feet, rather than the one size fits all approach of general shoe inserts. Orthotics aren’t just for foot pain; if you have back pain or body aches then getting custom orthotic inserts in Los Angeles can help to alleviate your pain. By supporting the three anatomical arches of the foot, orthotics put your body into alignment and provide necessary support for the base of your feet giving you a solid foundation. With a solid foundation back pains and body aches begin to diminish. An ingrown toenail is a common condition that often affects teenagers and young adults. This occurs when the side of the toenail begins to cut into the skin next to the nail. The result can be extremely painful, and cause the skin to become inflamed. This common annoyance can affect every nail, but more prominently occurs on the big toe. Consult the top foot surgeon in Los Angeles if you are suffering from ingrown nails. Keep reading to discover more, including the symptoms, effects, and treatments. Ingrown toenails often occur due to poor nail maintenance (I.E. not cutting nails correctly, wearing poor fitting shoes). Early signs show the skin around the nail to become reddened and feel tender. If not caught early the skin can become more swollen and painful, and even become infected. Once these signs become evident is important to have the ingrown nail treated. Ingrown nails can often be treated with in-home therapy such as soaking your feet in warm water regularly and applying antibiotic cream. If in home treatments do not help subside your symptoms, then visit the top podiatrist in Los Angeles at Tower Foot and Ankle and Dr. Jamshidinia can treat you the same day! This treatment is for a slightly ingrown nail that is causing pain and inflammation, but no pus. Doctor Jamshidinia, one of the best Podiatrists in Los Angeles, may treat the ingrown nail by placing cotton, floss, or a splint under the edge of the nail to separate the nail from the overlying skin. Although this is one of the more common toe problems in Los Angeles, the problem can become severe. When this occurs Dr. Jamshidinia may trim or remove the ingrown portion of the nail. Before this procedure, your toe will be temporarily numbed with a local anesthetic. Rest assured knowing you are under the care of a prominent foot surgeon in Los Angeles. For persisting issues that remain despite treatment, Dr. Jamshidinia may suggest podiatric surgery in Los Angeles. The quick foot procedure would consist of Dr. Jamshidinia removing a portion of your toenail along with the nail bed which lies below it to prevent that part of your nail from growing back. Ingrown toenails can be annoying and painful. If you are experiencing an ingrown nail it is important to find a certified podiatric surgeon in Los Angeles. If left untreated you can experience many viruses and prolonged pain. If you have an ingrown toenail, visit Drjamfeet.com to learn more information on correcting your nail, or call us at (310) 247-9255. Just about anyone who works out regularly is at risk of getting athlete’s foot – a contagious skin infection between the toes cause by the ringworm fungus. You can catch the fungus through direct contact with an infected person or by touching surfaces contaminated with the fungus (especially in moist environments such as showers and locker room floors). Don’t throw off your workout routine because of athlete’s foot. That’s nothing your Los Angeles Podiatrist can’t fix with a course of topical antifungal medication – call today 310.247.9255 for more details. Excessively wearing high heels and ill-fitting shoes can contribute to the growth of nasty bunions. However, bunions are also hereditary – the ones your mom and her mom used to have. Reconsider pointy toe flat or shoes. Treatments for bunions includes the use of custom orthotics to hold the feet in a more neutral position. Winter is the season of dry soles and cracked heels. Dry and cracked feet make wearing high heels unbearable and irritating. However, winter is the best season to hide your feet in trendy thigh-high boots and short booties. The trick is to keep your feet moisturized at night by applying a generous amount of lotion and wearing socks to sleep the night before – which helps to lock in the moisture to dry areas of the foot. Corns are hard painful growths, typically seen on the soles of the feet that grow into the foot. Corns develop due to pressure, usually from the type of shoes you wear that irritate the skin on your feet. Callouses on the other hand are less painful but can be caused by the same friction. The solution to this problem is surgery to cut out the hard skin. Also, it’s probably time to reconsider some of your shoe selections. See warts treatment for similar procedures. “Hammertoes are caused by an imbalance of the tendons that bend and extend your toes.” Wearing heels that are tight at the toe region increases the risk of getting hammertoes. Your solution is to try using cushions in your shoes. However, the only real solution for your painful hammertoes is surgery to correctly fix the problem. Improper nail growth causes ingrown toenails – this could be due to the poor trimming of your own nails, improper cutting by an untrained nail technician and wearing tight fitting shoes. The best way to prevent ingrown toenail is to trim your nails straight across using a clean instrument or nail clipper. If you or someone you know has an ingrown nail, seek ingrown toenail treatment by a podiatrist for proper removal.